AFTER Union Minister for Environment and Forests Veerappa Moily’s recent decision to revive the long-defunct regulatory body, Genetic Engineering Appraisal Committee (GEAC), agro-biotech industry is now lobbying for the removal of state clearances for projects to research and commercially produce genetically modified (GM)Ã”Ã‡Ãªcrops in the country. Former environment minister Jayanthi Natrajan had suspended research and development of GM crops in 2012 when she decided not to approve decisions taken by GEAC. Natrajan also stopped the meetings of the regulatory body. In India, institutions and companies need to take a clearance from GEAC and then get a no-objection certificate (NOC) from the state where it plans to conduct trials. The state clearance was introduced by former environment minister Jairam Ramesh in 2011 after Bihar, Kerala, Rajasthan and Madhya Pradesh refused field trials of GM crops arguing that agriculture is a state subject. (see ‘States’ entry ruffles GM lobby’, Down To Earth, September 30, 2011) “NOC is the next target for the minister,” says a senior official in the environment ministry. “The matter is also likely to be discussed during the GEAC meeting on March 21.” Talking to Down To Earth, GEAC co-chairperson Hem Pande said, “The meeting would be more of stock taking and setting an agenda for the next meeting as committee members have not met for a long time.” He refused to elaborate. Agrobiotech companies’ collective body Association of Biotech Led Enterprises–Agriculture Group (ABLE-AG), forum for agricultural scientists National Academy of Agricultural Sciences (NAAS) and public research institutions such as Indian Council for Agricultural Research (ICAR) have intensified their demand for the removal of state NOCs in the last two months. They also want that the GEAC permissions should be for a longer period of time than the existing two years. Last month, NAAS also held a meeting which was attended by around two dozen senior scientists from Delhi. The scientists during the meeting on GM Crops for Nutritional Security, which was chaired by M S Swaminathan, decided to create awareness about GM crops to create a pan-India political support base for promoting GM research. They also sent a submission to various ministries in support of removing NOCs. NOCs have been a big hurdle for the GM research in the country. An industry expert says state clearances are a difficult task in India, especially with Centre-state frictions. “For example, agro-biotech firms in Andhra Pradesh, which was a popular destination for GM research, might get affected due to the Telangana issue. Many are now thinking of moving out of the state,” says he. Another industry expert highlighted that getting state NOCs is a long-drawn process in which the companies have to repeat the GEAC clearance process. “Maharashtra government has in the past welcomed the GM technology, but the state wants the companies to furnish the same set of details that are required for GEAC clearance. The state asks for all bio-safety data and other related information which is a cumbersome process.” He adds that states such as Uttar Pradesh and Madhya Pradesh are willing to give GM clearances for only cotton. “NOCs are a big problem not only for the industry but also for state agricultural universities, central universities, ICAR, and institutes under the department of biotechnology. The state governments put the burden of conducting trials on public research institutions and as a result their own research suffers. Public institutions have limited land and manpower. If they divert their resources for private research when and where will the public institutions do their research?” questions a senior scientist with ICAR. The decision to resume GEAC meetings has brought relief to the Rs 10,000-crore seed industry in India. It is learnt that over 100 applications for GM crop field trials are pending before GEAC since March 2013. The new applications are mostly focused on rice, maize, cotton, cauliflower, ladyfinger and wheat, and are aimed at testing important crop traits such as salt tolerance, yield increase, drought tolerance etc. N Seetharama, executive director of ABLE-AG, says the last two years of regulatory stalling resulted in huge monetary losses for both public and private research institutions. He says that as a result, India has lost out to countries such as China that are investing in GMÃ”Ã‡Ãªcrops. This, he believes, has lowered the morale of the scientific community at large. Seetharama adds that only Punjab, Haryana, Gujarat and Maharashtra are at present supporting field trials of GM crops. ICAR director general S Ayyappan was quoted in the media applauding Moily’s decision. He said there is an urgent need to create awareness about the benefits of GM crops and biotechnology. It will be a tool not only to increase productivity but also nutritional value. He made an appeal to Indian scientists to communicate with the public and policy-makers about the safety and benefits of GM crop products and remove fears and apprehensions. While the industry has welcomed the recent decision to revive GEAC, the move has upset anti-GM activists. Rajesh Krishnan of Coalition for GM Free India says, “It is now amply clear that Moily was brought in the last innings to give approvals for the risky experiments of GM crops. With this one act the government has once again proved that they do not care about science or society when it comes to GM crops.” He adds that more than 400 scientific papers were evidences on the adverse impacts of GM crops. We did not eat lizards, when there was not GM crops. 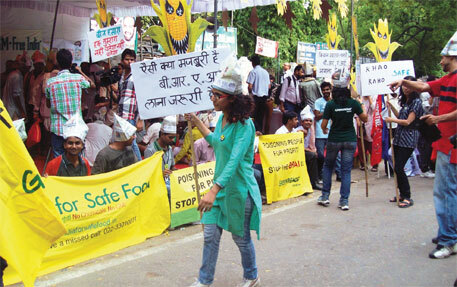 down with GM trials of corporates.